The world’s first ecological museum was designed and built in Mexico, at the archaeological site of Xochicalco, in the state of Morelos. The museum, about thirty kilometers south of Cuernavaca, was built as part of Mexico’s celebrations to commemorate the 500th anniversary of the voyage of Christopher Columbus. The project, which overs 12,676 square meters, was begun in 1993. Basic construction was completed in 1994 and the museum was formally inaugurated in April 1996. 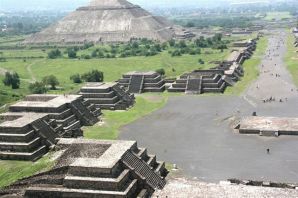 Xochicalco is an interesting archaeological site, best known for its astronomical significance. Some archaeologists have made a case that its most lavishly-decorated pyramid commemorates a major conference of astronomers, held here in the eighth century AD, in order to plan a calendar adjustment. At Xochicalco, the scenic and imposing ruins visible today reflect only a small part of what was formerly a much more extensive city. Numerous constructions, linked by cobblestone tracks, rise above the platforms; they include palaces, temples, ball courts and more than one “observatory”. 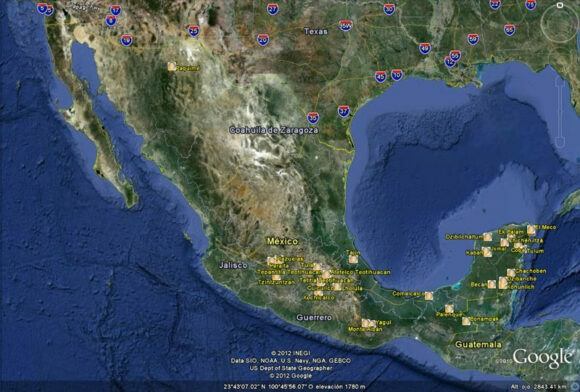 Xochicalco remained prominent until about AD1000, after which it was abandoned. When the Spaniards arrived in the sixteenth century, they learned of the ruins, but had no inkling of their astronomical significance. Two of the many natural underground caves at Xochicalco show clear evidence of architectural modification, with the perforation of an artificial hole or “chimney” from the cave to the ground above. These vertical shafts enabled very precise celestial observations. For instance, the vertical north side of the five-meter-long chimney down into one cave would have resulted in a precisely vertical beam of sunlight on the days the sun is directly overhead. Xochicalco was declared a UNESCO World Heritage site in 1999 and receives about 800,000 visitors a year. The challenge in building the museum is that there is no established settlement near the archaeological site, so there was no local provision of potable water, drainage or electricity. As a result, the local Mexican architect, Rolando J. Dada y Lemus, designed a building that was almost entirely self-sufficient. The museum has parking for 70 cars and 14 buses, and can accommodate 600 people at a time. How is this museum so sustainable? Underlying the museum is a 550,000-liter cistern. For a few months during the winter dry season, water has to be trucked in from a nearby reservoir – this is the only “input” from outside. The museum’s interior temperatures remain moderate all year because there is a 20-cm gap between exterior and interior walls. When exterior walls heat up in summer, that heat has little effect on the temperature of the interior walls. Shallow outdoor pools around the perimeter cool outside air before it enters the building. Skylights, used to illuminate the exhibits, also allow warm air inside the building to escape. Photo-voltaic solar panels provide sufficient power for computers, lights, and the cistern pump. Rainwater is captured and utilized for much of the year. Rolando Dada y Lemus, Armando Deffís. Arquitectura: 2001 a 2010: 2007: Edificios ecológicos autofinanciables. Aveni, Anthony F. (1980) Skywatchers of Ancient Mexico. University of Texas Press. Morante, Rúben B. (1989) “La Gruta del Sol”. México Desconocido, No. 147 (May), pp.17-20. Tzintzuntzan, designated a Magic Town in 2012, has two sixteenth century churches, equally ancient olive trees, a craft market specializing in straw goods and ornaments, plus an archaeological site which was the capital of the not inconsiderable Tarascan Empire. The Tarascan Empire, contemporaneous with that of the Aztecs, stretched westwards as far as the shores of Lake Chapala, with sporadic contacts into the Sayula lake area, and to the east as far as present-day Zitácuaro. The Tarascans spoke Purépecha, and today the local indigenous people prefer to be called Purépecha. The term “Tarascan” is more properly reserved for their ancestors and their pre-Columbian empire. “Tzintzuntzan” is an onomatopoeic Purépecha rendering of the sound made by a hummingbird. The ceremonial center was still fully active when the Spanish arrived. Tarascan buildings were constructed mainly of wood. Only the basements were normally built of stone and today, therefore, it is only these basements or yácatas that remain. Some of the cut stones which cover the rubble-filled interiors of the yácatas are ornamented with rock carvings. The scale of earth-moving involved in constructing the temples is remarkable. The entire 425-meter-long platform is man-made. On it were built five yácatas, on the tops of which would have been wooden and thatch structures serving as shrines. The semi-circular shape of these yácatas suggests that they were built to honor the god of the wind, Ik. The Tarascan ceremonial centre commands a magnificent view over the lake, whose waters would have been lapping at the platform’s base during some rainy seasons. The area behind the yácatas, next to the village soccer pitch blazes with color during the wildflower seasons of late spring and early autumn. The archaeological site has a small, modern museum. The Tarascans had a mixed economy, collecting fruits and forest products, fishing and undertaking agriculture, complete with terracing and irrigation. Some archaeologists have argued that many of the pre-Columbian peoples, dependent on the natural world for their immediate survival, were very ecologically-conscious. However, in this area, evidence from rates of lake sedimentation now suggests that maybe they weren’t quite so environmentally-aware after all. It seems that erosion rates were already on the rise by the time the Spanish arrived, suggesting that native agriculture was almost certainly not sustainable. Following the introduction of European diseases, the decline in population (and agricultural workforce) prompted a further increase in erosion rates as soil conservation methods could not be maintained. Erosion and sedimentation were exacerbated by the nineteenth and twentieth century deforestation of surrounding hills. The Spanish destroyed the Tarascan temples, carting off many of the stones to build Catholic churches in their new village. Observant visitors to the beautifully-proportioned patio of the former monastery beside the main church will spot petroglyphs on some of the walls there which betray the stones’ earlier placement in the yácatas. This building, decorated with fine old colored frescoes depicting Franciscan lore, and with parts of its original wooden roof still intact, houses the office of the parish notary and is not always open to the public. There are other peculiarities here, too, which say much for the realities of sixteenth century Spanish monastic life. When the monastery of Tzintzuntzan was built, two churches were constructed, one for the monks’ private use and the other for the lay Third Order. These two churches, only a few steps apart, are about as different as can be, given that they are of similar age. The monks’ church, beautifully restored following an arson attack, is light and airy; the Third Order church is dark, gloomy and oppressing. Both, in their own way, are awe-inspiring. To one side of the Third Order church is a complete-immersion font, shaded by two tall trees. In the large atrium in front of the monastery are a sixteenth century cross and the bent and twisted tree trunks of some of the oldest olive trees in Mexico, brought by special request from Spain for the express purpose of providing the monks with one of their accustomed foods. They are thought to be more than four hundred and fifty years old. Tzintzuntzan’s handicraft market is a cornucopia of straw work in every conceivable color, design and size, which make ideal Christmas decorations or gifts. Also on sale are elaborately carved wooden beams, and examples of the many different local pottery styles including the Ocumicho devil-figures and strange green pineapples as well as finely detailed, hand-embroidered scenes of village life. Tzintzuntzan is about twenty minutes drive from Pátzcuaro. This post is based on chapter 32 of my “Western Mexico: A Traveler’s Treasury” (link is to Amazon’s “Look Inside” feature), also available as either a Kindle edition or Kobo ebook. The Primavera Forest (aka Bosque de la Primavera, Sierra de la Primavera) is a volcanic region located immediately west of Mexico’s second-largest city, Guadalajara. The Primavera Forest occupies an ancient volcanic caldera, where the last eruptions are thought to have been about 30,000 years ago. The Primavera is a wilderness area of pine and oak woodland, with hot-water rivers, nature-trails and thermal spas. The park, which is about 30 km (19 mi) across (see map), serves as the lungs of Guadalajara and is popular, especially on weekends, for activities such as picnics, birdwatching, hiking, climbing, mountain biking and motocross. The average elevation of the Primavera Forest is about 2200 m above sea level, rising to 2270 m (7447 ft) towards the eastern edge of the forest which overlooks the city of Guadalajara. 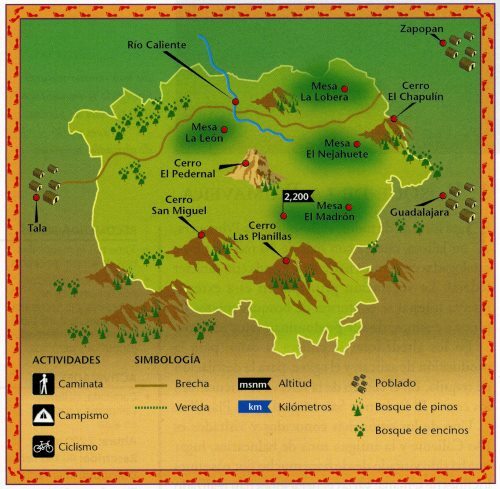 The three main summits are El Pedernal, San Miguel and Las Planillas. There is easy access to the 30,000 ha of protected natural area from various points, including the town of Tala and from Highway 15 (the main Guadalajara-Tepic highway) which skirts the northern edge of the Primavera. Agriculture and settlement have made incursions into the edges of the park, with land cleared for subdivisions or for fields of sugarcane and agave (for tequila). A major wildfire raged through parts of the forest in 2012. The park is home to about 1000 different plant species as well as 137 different birds and at least 106 terrestrial animals, including deer, puma, opossums (tlacuaches), armadillos and rabbits. Thermal springs are common throughout the Volcanic Axis of Mexico, and the hot river and many hot springs in the Primavera Forest are a legacy of its volcanic history. 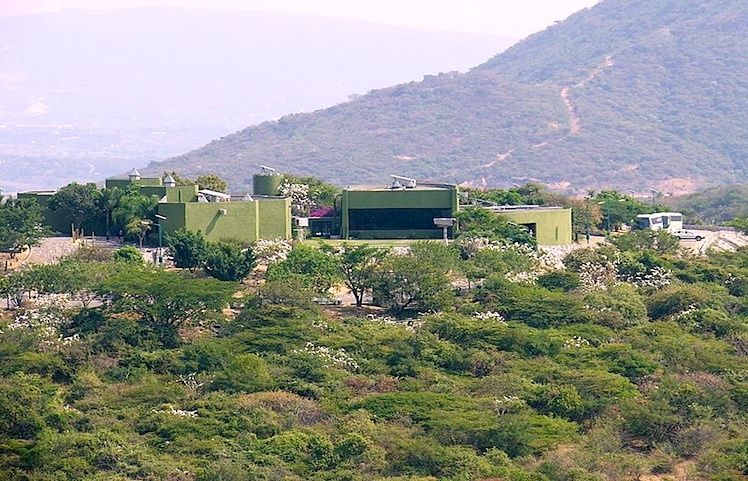 Río Caliente, the main developed spa in the Primavera Forest, famous for several decades as one of the country’s top vegetarian and health spas, closed in 2011, following some years of uncertainty regarding its land tenure status and increasing security concerns because of its relatively remote location. The hot springs in the park have been subject to numerous exploratory studies by the Federal Electricity Commission (CFE) which considers the park a potential source of geothermal power. The CFE drilled a dozen wells in the 1980s, finding that six of them offered sufficient flow for power production. The CFE believes the park could support at least three 25 megawatt geothermal plants. Drilling was suspended between 1989 and 1994 when the Jalisco state government ordered the CFE to carry out environmental restoration to areas damaged by drilling activities, and the plants have not yet been approved. As veteran explorer-author John Pint points out in “A geopark in my back yard?”, the Primavera Forest is well known to geologists for its giant blocks of pumice, up to several meters across, which are among the largest found anywhere in the world. One of the best locations for seeing these is in the 50-meter-high walls of the Río Seco arroyo on the northern edge of the park, on the outskirts of the small community of Pinar de la Venta. The cliff face has a thick band of pumice overlying numerous thin layers of lake sediments. The pumice blocks are highly vesicular (full of holes) and therefore surprisingly light for their size. The Primavera Forest is also well known to geologists (and archaeologists) because it has significant amounts of obsidian, a hard, glassy, usually black rock. Obsidian is easy to find (often in big chunks) in several parts of the park. The obsidian formed when blocks of hot lava, still molten, rained into the cold waters of a lake, cooling instantaneously. When fractured, pieces of obsidian acquire very, very sharp edges. Even today, some surgeons still prefer obsidian scalpel blades, recognizing that they are far sharper than those made from even the best steel. Obsidian is found throughout this region, and while usually black in color, it can also be found in a range of hues, including red and even rainbow patterns. Not far from the western edge of Primavera, at the foot of a steep-sided knoll called El Picacho is El Pedernal, reputed to be the largest obsidian deposit in the world, covering 4 square kilometers, from which an astonishing 40,000 cubic meters of rock have been extracted over the centuries. 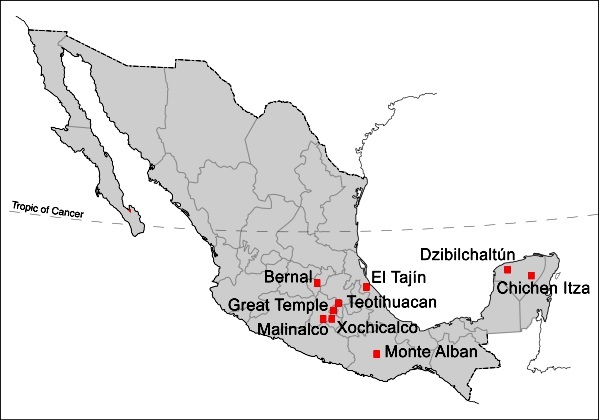 Sophisticated chemical techniques have shown that El Pedernal obsidian was widely used in Mesoamerica, finding its way as far north as California and as far south as Oaxaca! The pre-Columbian obsidian jewelry from this region, consisting of very thin wafers of rock, is unique to this area, and clearly the work of highly skilled specialist craftsmen. One particularly fine example (now in the museum in Tala) is a necklace fashioned out of wafer-thin obsidian carvings of human figures, each pierced by a tiny hole. In the absence of metal tools, the patience and dexterity required to have made these is truly amazing. The art of obsidian carving has not been lost. Skilled artisans in Navajas, another nearby village, continue to this day to chip and shape chunks of obsidian into spheres, chess boards and beautiful works of art, often representing animals. In future posts we will consider the formation of the La Primavera Forest in more detail, and also look at the extent to which the pressures resulting from its proximity to the city of Guadalajara threaten the park’s long-term health. John Pint is one of those spearheading the proposal of seeking UNESCO designation for La Primavera as a GeoPark. U.S. Peace Corps Volunteer and geologist Barbara Dye has written a beautifully-illustrated 72-page guide (in Spanish) to the geology of the Primavera Forest: “La Apasionante Geología del Área de Protección de Flora y Fauna La Primavera”. Mexican cuisine has been one of the country’s most successful cultural exports over the past twenty years or so and most large towns in North America and Europe now boast at least one Mexican restaurant, even if the menu is not necessarily “authentic”. 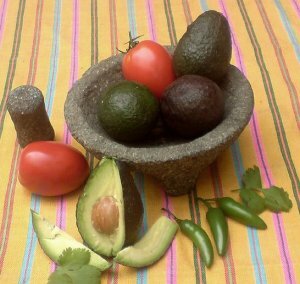 For those wanting to experiment, the basic ingredients for Mexican meals can now be bought virtually everywhere. The increasing popularity of Mexican food has been rivaled only by an extraordinary increase in the consumption of Mexican drinks, including Corona beer and tequila. 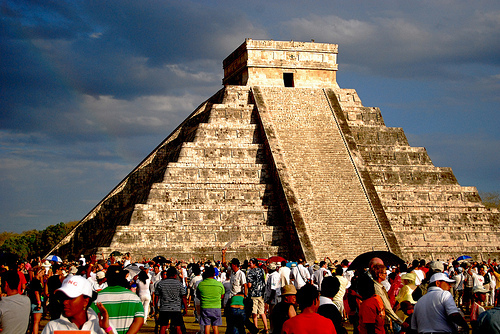 Archaeologists have also taken much more interest in Mexican food in recent years. 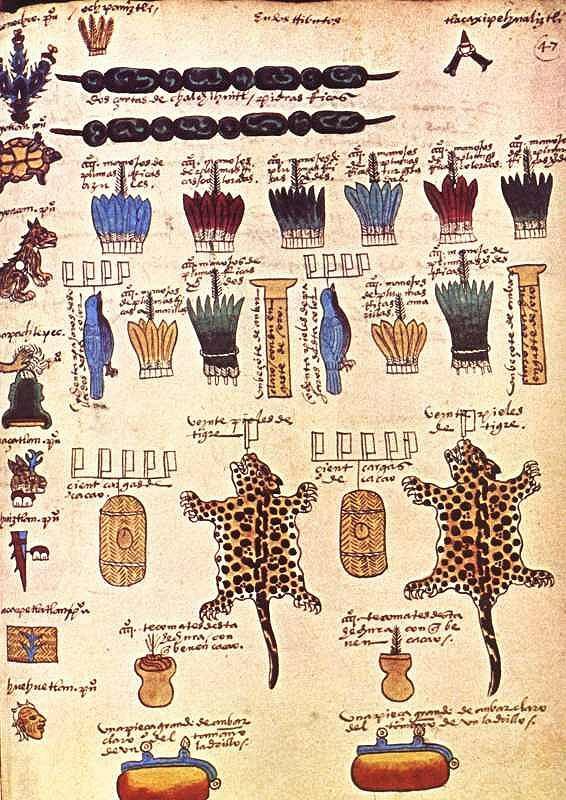 By 1970, studies carried out at various locations, ranging from Tamaulipas in the north of the country to Oaxaca in the south, had gradually led to the conclusion that the earliest plants to be domesticated in Meso-America were corn, beans and squash, and that all three had been domesticated between about 7000 and 10,000 years BP (Before Present, not British Petroleum…). Further research subsequently led most archaeologists and palaeo-botanists to believe that squash was actually domesticated much earlier than corn. Re-evaluating cave samples, originally collected in the 1950s, using an improved carbon-14 dating technique, anthropologist Bruce Smith found that the squash seeds from one location were between 8,000 and 10,000 years old, while the oldest corn and bean seeds were much younger, less than 6,000 years old. While Smith’s study does appears to confirm that squash was domesticated first, it does not necessarily mean that this squash was domesticated for its food value. Many experts think that early varieties of squash may have been domesticated primarily for their gourds, which could be used as ready-made drinking vessels and fishing floats. With the passing of time, the ancient peoples of Mexico domesticated and cultivated many other native plants, including tomatoes, chiles, potatoes, avocados, amaranth, chayote (vegetable pear), cotton and tobacco. If you enjoyed this post, you might also enjoy Geo-Mexico: the geography and dynamics of modern Mexico.